Devon was visited today by a hundred feet tall Poseidon, who is angry about the plastic pollution destroying oceans. Created by Beach Artist, Wales-based Marc Treanor, the sand etching was commissioned by the European Environmental Bureau and backed by Friends of the Earth. Marc’s work was visible for several hours before the tide came in and carried Poseidon back to the ocean. This comes as new polling data commissioned by Friends of the Earth indicates that 81% of people have done something to reduce or cut out their use of plastic, for example by purchasing a reusable shopping bag or avoiding the use of plastic straws. Here at Saunton Sands and across the Brend Hotels group, we are taking steps to rid our hotels and restaurants of unnecessary single-use plastic. Discover more about our environmental policy, plans and how you can help reduce your plastic use when staying or dining with us. “Poseidon has been defending oceans for millennia, but the current plastic pollution crisis is more terrifying than any sea monster. Tougher measures are urgently needed to protect our oceans, beaches and wildlife. 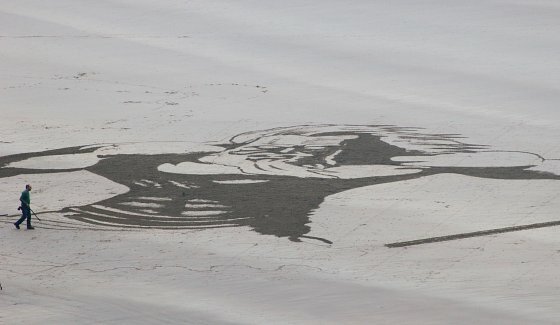 The Saunton Sands Poseidon is one of 6 works appearing on beaches across Europe in the run-up to Earth Day on 22 April. The theme of Earth Day this year is “end plastic pollution”, with all the works carrying the hashtag #BreakFreeFromPlastic, a global movement envisioning a future free from plastic pollution. Plastic is choking our oceans and killing marine life. Every year we throw away millions of tonnes of plastic - and vast amounts of it finds its way into the ocean. By 2025 – just 7 years away, the ratio of plastic to fish in the ocean will be 1 to 3, as plastic stocks in the ocean are forecast to grow to 250 million tonnes in 2025. The EEB is the largest network of environmental citizens’ organisations in Europe. It consists of around 140 member organisations in more than 30 countries (all EU Member States plus some accession and neighbouring countries), including a growing number of European networks, and representing some 30 million individual members and supporters.